Sometimes simple and easy is best. I was feeling snacky, but I didn't want anything complicated. Options? Hmmmm... Girl Scout cookies or... Toast! Toast wins! I sliced into a loaf of Dev's homemade wheat bread, popped it into the toaster, then slathered it with salted butter. 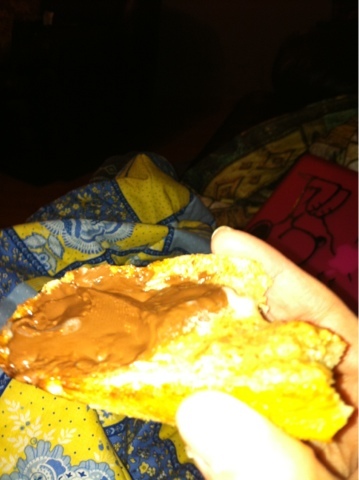 After contemplating toast condiments, I settled on half Nutella and half almond butter. Washed down with a cup of chamomile tea, this was the perfect snack! This Is One Happy Dog!